The Boston-born, Los Angeles-based, artist has quickly risen to become one of the most talked about names in American contemporary art. A high-school athlete himself that could never sit still, his paintings are packed with energy that reflects that hyper-active childhood — the layering of pattern, the dynamic, odd interiors — and yet a balanced hierarchy of compositional geometry. He uses his own photography and appropriated images to make his paintings – as he once said: “Jeff Koons does not own basketball”. 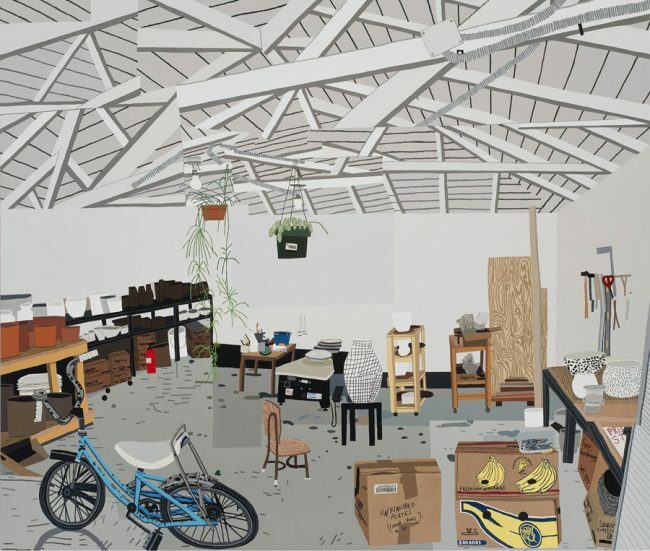 His subjects include sports-related scenes, domestic interiors, and paintings of vessels and vases. 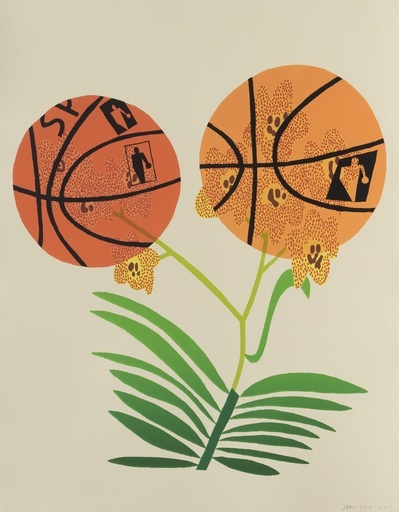 Notwithstanding the subject matter, be it a portrait of a basketball player or an orchid, all of his works plays with a disorienting compressions of space. The intimate settings invoke the work of forebears such as Matisse and Hockney, while the close up portraiture reminds us of an invasive paparazzi lens. He creates otherworldly realities within the outlines of the plants and leaves: vessels set against neutral backgrounds contain a sprawling green golf course; a coral reef with exotic fish; a lush garden; a painter’s studio, all scenes that exist solely in the confines of the object within which they were drawn. Overall, Wood paints what he loves—or at least what he cares about—and he strives to make us care about it too. 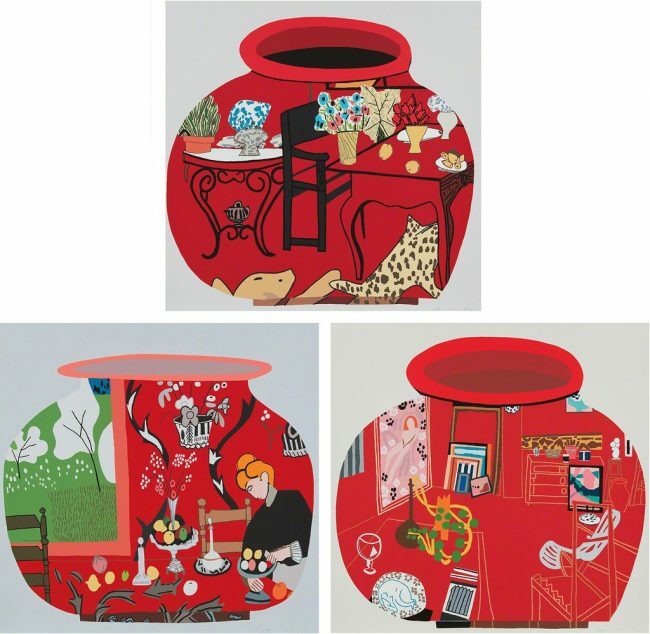 He has painted boxers and tennis players, his friends and family, his home and scenes from his childhood, and as of late his wife’s pots feature frequently within his work. Wood has created a signature style that has taken the art world by storm and has secured a place for his work in all the major private and public collections. With one foot rooted in the pop art movement from which he takes the colors (of Warhol), the flatness (of Haring) and the defined shapes (of Lichtenstein) the other is decidedly modern, paying homage to Van Gogh, Hopper and Picasso among others. Both inspirations are steeped in tradition yet completely fresh, Wood manages to capture the impossible sharpness of modernity with the familiar feelings of home. When speaking of his interior’s in particular, Wood claimed he was creating new memories of his former residences “I’m interested in exploring the spaces that I’ve inhabited and the psychological impact they’ve had on me and my memories of them,…And then I can create a new memory of that space.” The result is the perception that his work is very sincere, it translates not only to other languages but will easily withstand the test of time. 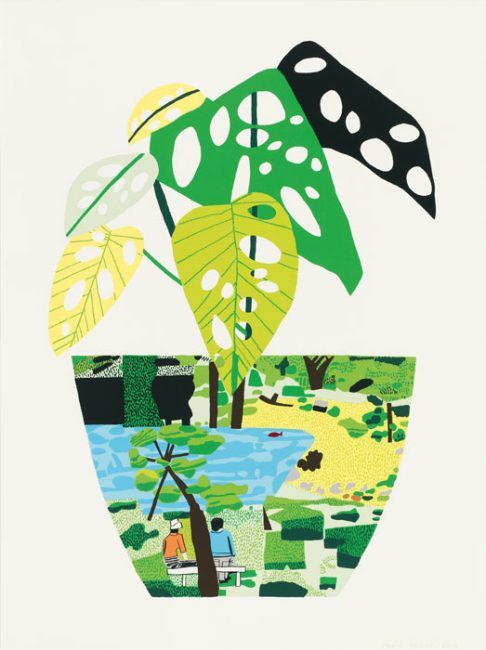 Drawings and limited edition prints by Jonas Wood are now available at Guy Hepner.